These treatments can take anywhere from 2-3 hours to be completed. The overall healing process is about 4-6 weeks. Most technicians perform a few passes, assessing the work as they go and adjusting as needed. A touch up is also recommended after the first treatment because the pigment will have settled into the skin and the technician will be able to see where some fill-in work needs to be done. Touch up sessions last about 1-2 hours. In this session, you can add thickness, more hair strokes, and your pigment color can be adjusted. Getting a touch up before healing has been completed is not recommended and doing so can cause scar damage. 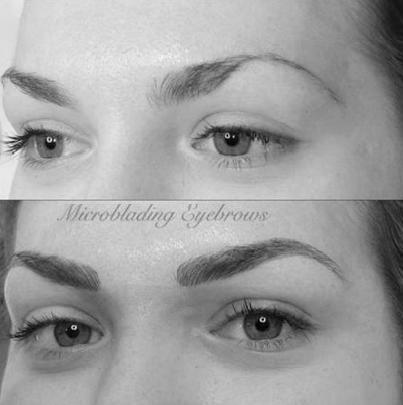 Depending on the skill of the technician, microblading is not very painful. Some have said that they felt little to no discomfort during the process, while others are quite sensitive. The area around the brows may be slightly red and swollen post procedure. The post-care protocols are key to getting the best out of a microblading procedure. Since it is an invasive procedure, you will want to avoid things like excessive sunlight or sweating. It’s common to expect 3-5 days of downtime – avoiding activities like your evening yoga class or a day at the beach until fully healed. To help with the healing process, there are a number of ointments and salves available and always keep the procedure area clean. Your technician will schedule a touch-up session a few weeks after the initial visit as mentioned above and after this, you can expect your eyebrows to maintain the ink for 8-18 months. If you have questions about the procedure or if you are interested becoming certified in an intimate and intensive microblading training program, visit our website www.alliedbeautyexperts.net/microblading-training-certification. Here you’ll find our upcoming training dates, locations, and a course overview. As always, feel free to contact us at 800.444.7546 or email info@beautyexperts.net for more information.